Mix bacon and all of the nuts in a large bowl. Melt sugar with water. Add nuts and stir. Mix chile powder into the blend. Spread mixture onto parchment-lined sheet pans. Bake at 350° for 20 minutes. Preheat a large roasting pan in a 450° oven. Carefully remove the hot tray from the oven, then add the oxtails. Season with salt and pepper, drizzle with olive oil, toss, and place in the oven for around 20 minutes, or until golden and caramelized. Meanwhile, trim and halve leeks and celery lengthwise, then chop into rough - to 1-inch chunks. Peel and chop carrots into similarly sized pieces. Place vegetables in a large ovenproof casserole pan over medium-low heat with 2 tablespoon of olive oil. Pick leaves from the thyme and rosemary, roughly chop, and add to the mixture. Add shallots and bay leaves. Cook for around 20 minutes, or until soft and sweet, stirring frequently. Remove oxtails from the oven and set aside. Reduce the oven temperature to 325°. Add cloves and flour to the vegetables, stirring well to combine, then pour in tomatoes and wine (if using). Add oxtails and any roasting juices, cover with beef stock (or 8 cups water), and stir well. Turn the heat up to high and bring to a boil, then pop on the lid. Place in oven for around 5 hours, or until meat falls away from the bone, stirring every hour or so. Add a splash of water, if needed. 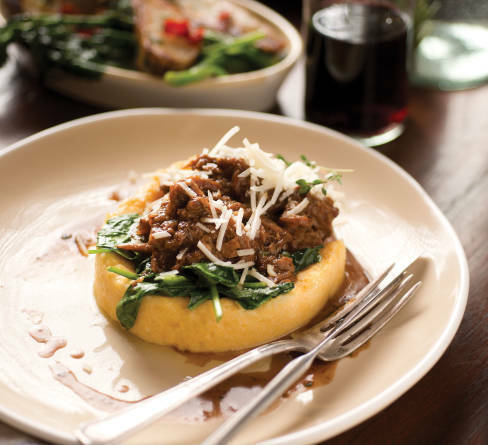 Within its upscale, clubby atmosphere, the Corn Maiden seeks out local ingredients—some raised on-site at Santa Ana Pueblo—for its New American cuisine. Chef Ernesto Duran, a Las Vegas, New Mexico, native, says customers’ favorite mains are classic proteins: New Mexico filet, pan-seared scallops, and rack of lamb. But, oh, those sides! Tucumcari cheddar risotto, tomato bacon jam, charred cherry heirloom tomatoes, braised fennel, and these popular potatoes. “While nearly everything else around it changes, these potatoes are the Corn Maiden’s one constant,” he says. Wash potatoes and cut into -inch slices using a mandolin or knife. Place potatoes in a 12-inch cast iron skillet. Mix together heavy cream, Parmesan, green chile, and garlic. Season to taste with salt and pepper. Pour mixture over potatoes, cover with foil, and bake in preheated oven at 325° for 2 hours until potatoes are golden brown and tender. Remove from oven and serve. BURGERS, BROWNIES & BEER OH MY! Follow the Wizard of Oz’ish yellow path to the counter, order up a hamburger (the Cowboy, Greek Lamb, and Silver City Chorizo are customer faves), then settle into a window seat for some prime people watching on downtown’s busiest street. Chef Shevek Barnhart earned his knives at the Culinary Institute of America plus 10 restaurants across the Mediterranean region. (Albuquerqueans may remember him from Dietz Farm Gourmet.) His staff promotes this carrot cake as the “best on the face of the planet”—rich, moist, and full of fruit and nuts. Key tip: Mix the dry ingredients thoroughly before adding any wet ingredients. 1. Oil a 10-inch cake pan with pan spray, then dust with flour. 2. Thoroughly mix dry ingredients in a bowl. 3. In a separate bowl, beat eggs and oil together. Add to dry ingredients and mix thoroughly, by hand. 4. Pour into cake pan. Put pan on a cookie sheet and bake for approximately 1 hour at 350°. 5. Spin cake front to back and bake approximately 15 minutes more. A toothpick will come out clean, and the sides of the cake will have begun to pull away from the pan. 6. Let cool on a wire rack. Run a knife around the pan’s edge when the cake is cool enough to handle. Put a plate large enough to cover the pan upside down on top of cake. Turn plate and pan over, holding them tightly together. Lightly tap them both on a counter or table, all around the edges. Cake will detach from the pan to sit on the plate. Refrigerate until ready to frost.